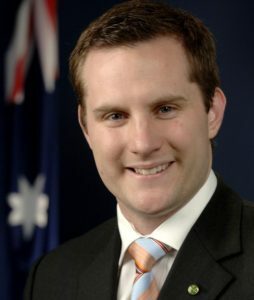 Hills Hornets Touch would like to welcome Alex Hawke MP as the new club patron of the Association. Joining the Liberal Party in 1995 and gaining preselection for the seat of Mitchell in 2007, Alex will be a active patron for Hills Hornets Touch over the coming years as the Hornets try to revive the club back to its glory days. In September 2015, Hawke was promoted to Assistant Minister to the Treasurer in the Turnbull Ministry. After Alex met with the Executive of Hills Hornets Touch we found that not only is he understanding of our cause, but he also plays the game when in Canberra and has performed some duties with the National players in conjunction with TFA. His first item of agenda as Club Patron is to assist the club in marketing our sport to the Hills region and ensure that the Hornets can provide a breeding ground for young aspiring children throughout the area. The Hills Hornets are in an exciting position and are appreciative for the time and dedication that Alex is providing the sport.